Oxfordshire's flag was registered in May 2017 following a request delivered in February from a collection of county bodies. Registration was secured after several months and the flag appeared on the registry on October 9th. A flag bearing a red ox head set against two white wavy stripes, running from the top left to the bottom right corner, all placed against a blue background, with a golden oak tree and wheat sheaf in respective bottom left and top right corners, had been popularly and widely flown across the county. Originating as the armorial banner of the shield from the coat of arms awarded to Oxfordshire County Council in 1949, the design included the blue of Oxford University while the white wavy stripes represent the River Thames flowing through the county. In combination with the red ox head, the arrangement punningly alluded to the name of the county town of Oxford, around which the wider county is based. The golden wheat sheaf, top right and golden tree, bottom left, represented the agriculture and woods of the county. 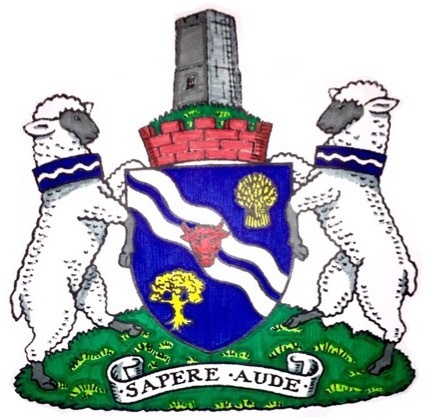 The arms were no longer used by any armiger (arms holder) following the 1974 reorganisation of the local authority. This acknowledged Oxfordshire emblem has been used by county organisations such as the local constabulary, whose badges bore the ox head and wavy stripes; and the county fire brigade; and attesting to its long established local provenance, it further appeared on souvenir items such as a decorative horse brass, a car badge and a stitching pattern map of the county. The flag has also been much used by the county's scouts both at home and at international gatherings, to represent their county, as seen in a 2016 visit to Iceland, and continues to be proudly used by them in shield shape, as a badge. Oxfordshire Rugby Football Union's badge is also the familiar county emblem whilst the county's rugby players proudly wear the Oxfordshire flag on their sleeves! The red ox on white wavy stripes and blue field is also the badge of the Oxfordshire county hockey association whilst the county's junior badminton team proudly present the county flag in competition and the design appears on the sign of the Oxfordshire village of Goring. Most notably the acknowledged county flag appears on the Twitter profile of a county based news service. http://www.thamehistoricalsociety.org.uk/ from right across the county. 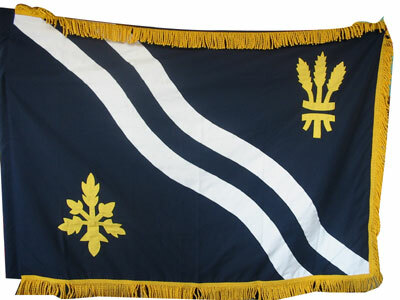 The Flag Institute required further revision of the existing design which led to the current version created by Charles Ashburner, chief executive of the flag manufacturer, http://www.mrflag.com/. Following its registration the Oxfordshire flag began to fly. As far as I am aware, this is a banner of the arms and is seen at the HQ of Oxfordshire County Council flying alongside the Union Flag. Whilst in Oxford on 05 February 2005, I noticed that County Hall, New Road, Oxford (the aforementioned headquarters of Oxfordshire County Council), was indeed flying the flags as described in Michael's email. However, there is no fringe on the banner of arms. Further, County Hall, Oxford usually only flies flags on so-called "Red Letter Days"; it does not make a practice of flying a flag every day and moreover, the other flagpole often flies the European Union flag, instead of the Union Flag or sometimes, the flag of Saint George (Queen's Jubilee 2002). Given the special national nature of the day (anniversary of The Queen's accession to the throne), it can only be assumed that the county council - along with many colleges of the university and even churches of the Church of England situated in the city - were choosing to fly the Union Flag. The banner of arms flown at County Hall, Oxford is of the same proportion as the Union Flag, which makes it slightly unusual locally, as those of the individual colleges of the university, when they fly their banners of arms, are of different proportions to each other. County Hall has been flying both the Union Flag and the County's Banner every day since I got here in September (2004). On eBay was posted the same flag but lacking a red ox head in the centre. I've no idea if this was an unofficial variant. Using the ox head gives the flag a more local identity, and gives it some sort of relationship with the city crest (and those of Oxford United and Oxford City FC). Newton Newton flags shows a second flag also labeled "Oxfordshire CC". This appears to be a dark green field with a circular coat of arms in white on it. 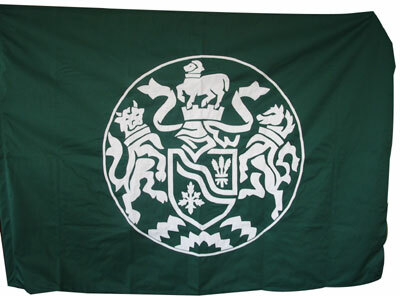 This flag is a stylised version of its Coat of Arms contained within the capital letter 'O' for Oxfordshire - in white on a dark green flag. However, I have never seen this flag actually on display anywhere in the county, although this of course, does not mean that it does not exist. This is the flag of the Oxford County Council.